It was 1997, the summer when I was moving from Minneapolis to Madison, and the one for which the Pop album became the unofficial soundtrack. I recall a voice on the radio saying U2 were playing in the Cities some time in October, when I would already be living in Wisconsin. But I would not just give up. I had to go see the band live. I joined the U2 online forum, WIRE, and quickly added my first post: “Madison; who is going?” soon after getting a ticket for the July 25th show at Camp Randall. As the date neared, I became acquainted with fellow fans, some of them veterans at concert-going, and some like me, who would be going to see the band for the first time ever. The day before the show, I woke up with abdominal pain. Almost convinced that this would put a damp on my concert-going plans, I went to the clinic at the University of Minnesota to get checked. Thankfully, it was nothing serious. Right after the appointment, I went over to Dinkytown to grab lunch at Subway. And, as soon as I took my first bite, “Where the Streets Have No Name” came on the sound system. The next morning, the sign was even clearer; the song that was playing as soon as I turned on the radio–“One”–made me feel as if, indeed, this was a major event in my life. Even if I was slightly concerned about the weird pain from the day before, I was ready to go to the Greyhound terminal, take the early bus to Madison, and go meet with people from the online fan forum I had exchanged emails with over the preceding couple of weeks. I spent most of the bus ride listening to my Zooropa tape. Upon arriving in Madison, I met with fellow fans and new acquaintances. 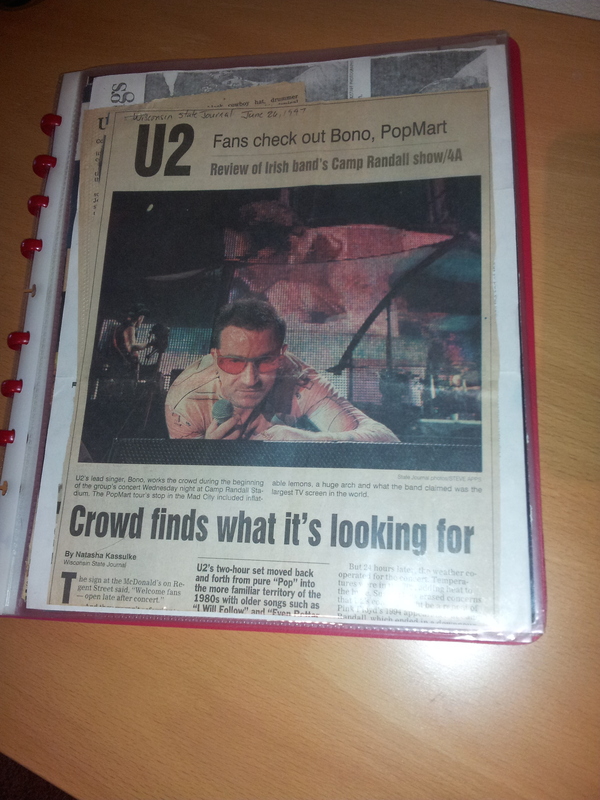 But when it was showtime, I was there, on my own, surrounded by thousands of people, most of them faithful U2 fans. At that point, I was 22 years old and I had been a fan for ten years. The concert did not disappoint; quite the contrary. The performance became a spiritual experience for me, and not in a cliché way. I had been at concerts for other major acts before, but this one was what my young adult self needed and deeply connected with at the time. There was the spectacle with grand music and it was absolutely fun. If I gazed over to my left, I could see Van Hise Hall, the UW-Madison building where I would soon be working as a T.A. and be a Master’s degree student. Could I have asked for a better campus event to introduce me to Madison and graduate school?! The finest moment of the concert arrived during the rendition of the first song I hard heard that morning when I woke up in my apartment in Minneapolis–“One,” which happens to be one of my favorites for its amazing lyricism. Being able to enjoy it live felt like a transformational experience, as if all my chakras lined up nicely–musical Reiki?–and in a new way. I remember being there, at Camp Randall, that July 25th, 1997 evening, not worrying about the pain from the day before,listening to the band play this song and thinking to myself: “OK, the universe makes sense…”. It was an #unforgettablegig that I remember fondly now that I have seen U2 play in several venues and tours. Putting Together a Personal Cartography | CentroVoices.